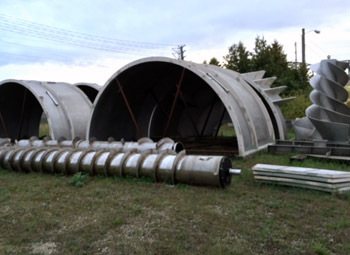 Description: 400 TPD Voith High Consistency Batch Pulper, New/Unused Surplus Equipment. Pulper Tub 316 SS. High Cone Rotor 316 SS. Designed to Pulp Mixed Office Waste at 17.3% Consistency. Dimensions: 18’-8” Pulper Tub Diameter. OAH: 18’-4”. Inside Height: 17’-4”. Dump Nozzle: 24”. Includes Pulper Drive Gear Reducer. Falk 1500 HP Gearbox, Ratio: 11.11 to 1. Motor not included.